The Universal Antenna Rod is a specially designed dowsing rod, some call it a divining rod, for the treasure hunter, both professional and beginner, who need an accurate instrument for establishing locations and depths for metals and minerals. 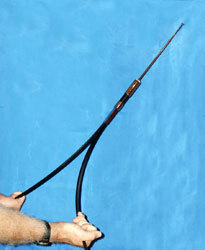 The power tube of this dowsing instrument is charged with a special mineral crystal load allowing the versatility for use in the search of a variety of individual metals or minerals. By installing a small sample of the item you are searching for into the sample compartment at the tip of the tube; then you can use it to search for a treasure or mineral deposit that contains that same kind of material. 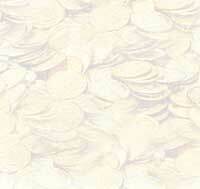 For example, if you are searching for gold, you will install a small sample of gold into the sample compartment. 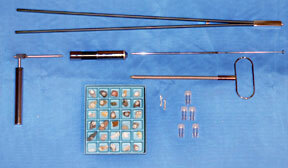 You can use this instrument to search for gold, silver, mercury, lead, copper, diamonds, oil, water or other substances. 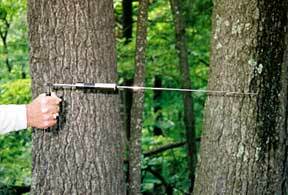 The lightweight, powerful instrument can be used to search for large or very small treasures. The antenna length can be adjusted according to whether you are looking for close by or distant targets. You will shorten the antenna if you want to find only sources of attraction that lie close by. You will extend the antenna when searching for more distant targets. You can use the instrument for both short and long range work when the antenna is fully extended. To operate the Universal Antenna Rod with the bearing handle, hold it as illustrated in the picture, with the power tube and antenna level. The nearly friction-free bearing in the handle allows the instrument to swing in the direction of your target. Also included is the spring handle. This handle is very popular with users of the Universal Antenna Rod. The instrument is held as shown in the picture. The action is much like that of a pendulum. You can watch which way the instrument swings and follow in that direction a ways and try again. Or you can use triangulation, as explained in the included instructions. Very good results may also be had by using 24" fiber handles. Just hold them as shown and turn slowly in a complete circle so as to face all directions. When you hold the handles as shown in the picture, the instrument and handles are in a delicate balance, such that it only takes a vary small reaction to cause the instrument to dip or pull downward. We consider this instrument one of the most versatile dowsing instruments ever built for the serious treasure hunter or prospector, since it can be used to search for distant or nearby treasures and can be used to search for specific metals or minerals by installing a sample of that metal or mineral in the sample compartment. This is a lifetime instrument, made for the professional, but it is also excellent for the beginner to start out with. It is good for large or small amounts. Numerous users have attested to its accuracy. The price of this instrument is $895 complete with all accessories shown, including a one-hand bearing handle, spring handle, 24" fibre handles, gold and silver samples, mineral sample set and comprehensive operating instructions. You may send cash, check, money order or charge it to your credit card. This instrument is unconditionally guaranteed for 10 years. If any service or repair is required during this period, it will be performed free of any charge. The Universal Antenna Rod is sold on a 30-day trial money-back guarantee. If it does not perform exactly as advertised, return it in good condition and your money will be immediately refunded.